Hooray, I went paddling for two weekends in a row in April! I'd organized last week's Opening Day paddle, which was just lovely, and the clubmate who lives on my block and gave me a ride that morning mentioned that she'd seen that it was supposed to get up to 80 and suggested that another paddle might work out well. As it happened, we ended up having 2, another clubmate called for a fairly longish paddle with an early start; I'd been thinking of a shorter one, and we thought that we would have takers for both if I sent out mine as well, and it worked out great. Mine was just a five and a half mile spin around Canarsie Pol, the first island outside of the Paerdegat, Canarsie Pol ("pol" is the Dutch word for an artificial island), with a leisurely lunch on the western end of the island to catch the breezes. TQ had run up to CT for the day and we had dinner plans, so this got me back in plenty of time. It was kind of fun doing back-to-back short paddles like this, just for the different flavors they ended up having - last week's we did have a certain time we needed to be back to the club, but it was so beautiful and calm out that we were revelling in the smoothness of the water, and it was just nice getting out there for Opening Day and knowing there was all kinds of Sebago potluck deliciousness waiting for us back at the club; yesterday's was more leisurely, there was time for one of the participants to trade his europaddle for a greenland paddle for a while, I broke out my GP for a while too (I always carry one as my spare but I don't paddle with it that often so it was good to practice) and we had great birds; last week a visit to the Canarsie Pol osprey nest platform was the farthest point on the paddle, but we didn't see any activity there and one of the club's better birders said that some migrating birds had been delayed due to unfavorable winds, so maybe the ospreys were having the same problem. This week I think we saw four of them, including one on the Pol nest platform, so that was neat; in addition, the oystercatchers that are always my favorite harbinger of Spring are back in force (usually I'm out on the bay enough in the spring that hearing the first "WHEET wheetwheetwheetwheet" of the season is so exciting - this year they got back while I was doing other things and they're all over the beaches already but still lovely to hear them), plus egrets in a marshy spot along the shore and some brants (who will be on their way north soon, they winter with us). In less-typical bird spottings, there was a pair of snow geese on the Pol, I've only ever seen those once in the bay, at West Pond so that was very cool. Later on, as Steve the Paddling Chef and I were just about back to the basin, a bit behind everyone else (we'd stopped for him to do a couple of rolls, he'd worn a drysuit with a ripped gasket and wanted to see how badly it would leak, plus it was warm for a drysuit so a little cooldown was probably nice), I spotted a loon in winter plumage who was swimming along just a few yards from Steve's boat. I said "Look at the loon! ", he looked up in the sky because he thought I said moon, but he figured it out in time to get a good look before it dove. Didn't get a picture of that one but did get the others, plus a cormorant who was just posing too nicely on a piling in the basin to pass by! Another fine paddle with Sebago, and I was home in plenty of time for a nap and a shower before dinner with the fella (he made oxtails and rice and beans for dinner, delicious). An excellent day, not a terribly ambitious paddle, but very pleasant! Here are a dozen more pictures - click on the first one for a slide show view. 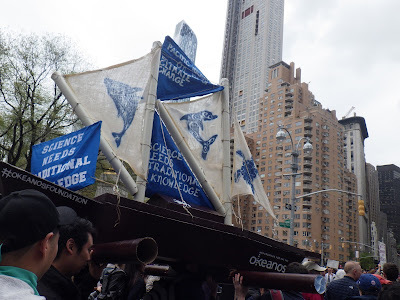 I mentioned that Saturday's rain wasn't enough to dampen spirits at NYC's March for Science; I was able to say that with confidence because I was able to go march with local members of the Okeanos Foundation who had built a beautiful scale model Polynesian voyaging waka to carry in the march and who invited all Pacific Islanders and their friends and supporters to join them. 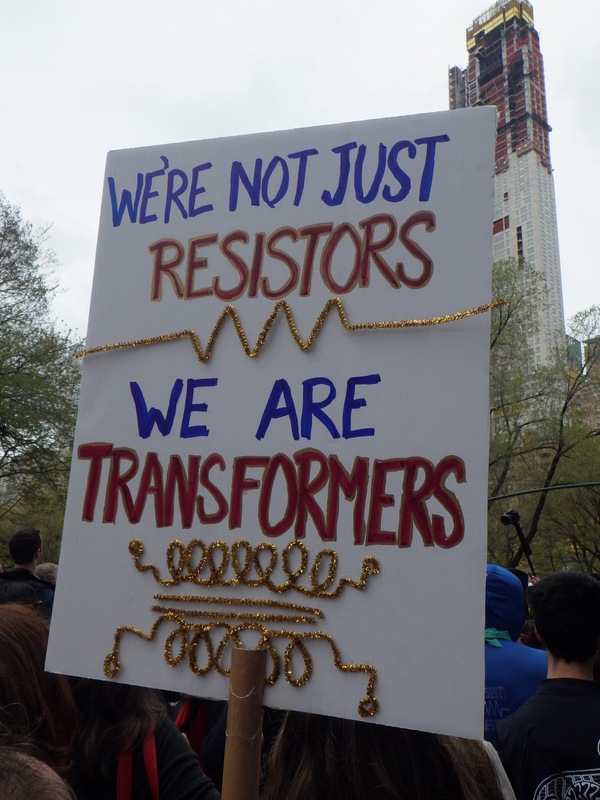 After joining in more protests in January and February than I've been in in my entire life, I'd had to take a bit of a break during March and April because of things that came up in both my personal life and work, but I'd been considering trying to fit the March for Science in before my tin whistle teacher's memorial service, and when I saw the beautiful model and the invitation on the Facebook page of one of my Hālāwai friends, that settled it. I've been very concerned by the various cuts and restrictions that the new administration seems hell-bent on putting on various government-run scientific organizations (NOAA, for instance, weather.gov is the first place I go for my weather but there was an interesting article in the Times this week that spells out impacts beyond those that a layperson like myself might think of), so I was very glad to join in. It was a great morning, I overheard someone say "This is the geekiest march ever, and I love it! ", and I totally agreed. There were a couple of students from the Rutgers Documentary Club who were talking to participants and asked me for a few words on why I was there, which was almost impossible because, you know, where do I even start? As a cancer survivor? 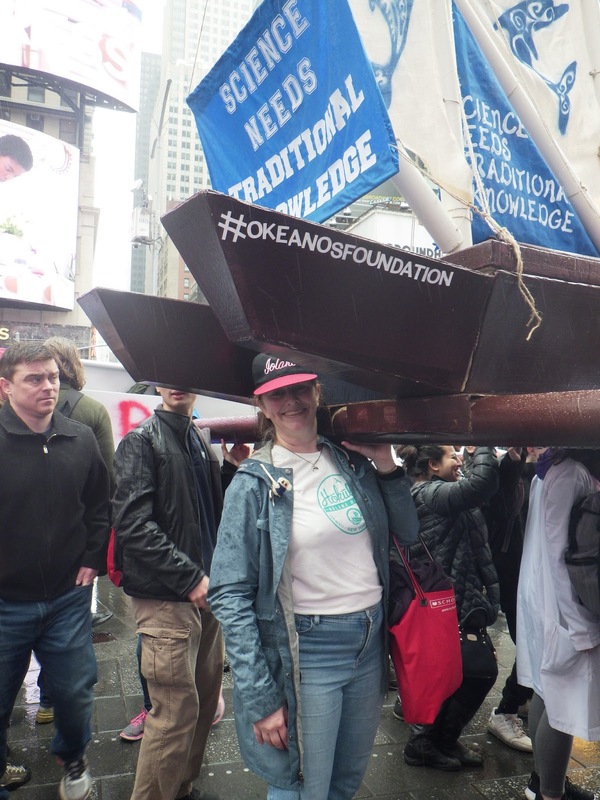 As a paddler and swimmer who can play safely in the waters of NYC because of the tremendous improvements brought about the Clean Water Act? As a fan of citizen science groups like Gotham Whale (oh jeeze that reminds me that I still need to get them reports from my seal paddles, I'm sorry Paul!)? Or on a more basic level, as someone who has walked through old graveyards and been amazed at the percentage of people who died in what your average modern US citizen would consider midlife? You can't care for something if you don't understand how it works. We need to care for our home here, along with everything on it, and good science is our best chance to understand how we can do that. Malama honua! More pictures on Flickr, unfortunately with the beautiful waka I forgot to take non-waka pictures and there were some very clever signs, but this gives some idea of how the day was. So glad I was able to stay for the whole event and still make it to the memorial service on time. It was a great event. Sunday was Opening Day at the Sebago Canoe Club, and what a stunning day! 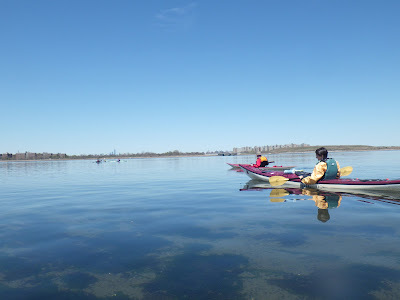 9 of us went out for a great paddle before the potluck and General meeting - it was beautiful, clear, and calm, with the Manhattan skyline very visible in the distance. A few of our sailors got out too, and our safety boat was launched successfully. This was my first paddle since February, and my first paddle on Jamaica Bay since January 1st, and it couldn't have been nicer. Forecast had called for light rain on Sunday up through the end of the week, but timing changed, the light rain was on Saturday (not enough to dampen spirits at the NYC March for Science though!) and then Sunday was just spectacular. I required wetsuits or drysuits because the water temperature is still in the low 50's in Jamaica Bay. 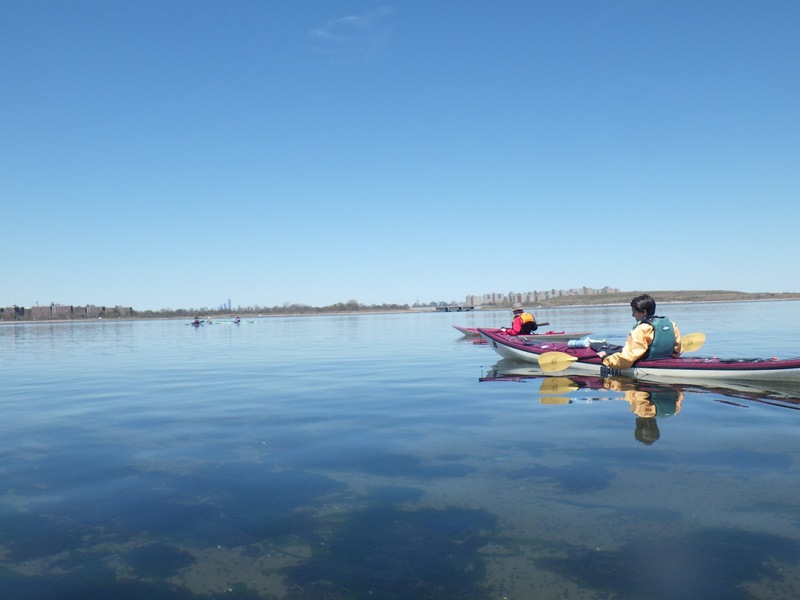 The air temperature was in the high 50's, and we were all kind of steaming in our gear as we paddled down the Paerdegat Basin, but once we got out into the bay all was well. Wonderful paddle, so good to be back out on J-bay with friends after a kind of hectic Spring - work's always a bit bonkers this time of year, and Saturday's memorial service marked the last (hopefully) of a string of losses among people who have touched my life in one way or another. I'd been aching for a nice quiet paddle with friends for weeks, and this was just perfect. Click here for more pictures, the day was about as photogenic as they come! Goodbye, Bill. I'm not the best tin whistle player in the world, but it's entirely because of your teaching that I'm as good a whistle player as I am. And a few photos from the session that broke out at the post-service reception. Wouldn't have been a proper farewell without it. Happy Easter from Coney Island! Forecast called for a ridiculously balmy 80 degrees, perfect weather for my annual swim with the Coney Island Polar Bears! I always think that some winter it might be fun to try to actually join them, the way that works is that there's a lottery for slots; you pay a $25 application fee and then if you come out for 12 swims within a single season (which runs from November through April) and are voted in by the members, you become a full-fledged Coney Island Polar Bear, with a patch you can wear and YES total bragging rights! After that you only have to do four swims a year to continue to be an active member; that first year would take some commitment and I think I would have to focus on getting the swims in early on - seems like the way to do it would be getting out there every week as the water gets progressively colder. Would be tough to do and still fit in my winter paddling, I would just have to make up my mind to make it a swimming winter instead of a paddling winter. Fun to think about, but for the time being I expect I'll just stick with my April dip. Would also be fun to see the New Year's Day plunge that the Polar Bear Club runs as a fundraiser for Camp Sunshine someday - but I have been ringing in New Year's Days with paddles for so long that it's hard to imagine not doing that. It would be such fun taking pictures there, though, that's an enormous and very popular event and people come up with some wild outfits for it! I was very glad to get out in the water today, it's been weeks since my last paddle (Staten Island seals in what was it, February?) and I've just been itching for salt water. Today was just great, I had a lovely time in the water and then asked if I could join in when I heard a friend talking about going to Ruby's Bar - I am so glad that whatever happened to save that place and some of the other Coney Island classics from the developers happened, that was the perfect way to wrap up the beach part of the day. Sorry it's not a very wide range of pictures, my camera got a memory card error right after the first circle-up, which happens right after everybody gets in - since I was already in, I couldn't open the battery compartment to take out the card & put it back in. I think I may have enjoyed the rest of the swim more after I ditched the camera, though! Here's the set of pictures I did get, though. Click for slide show view, as usual. Sorry I have been such a boring blogger of late, it's been a rough Spring. Nowhere near enough time on, in, or near the water. Hope to remedy that on Sunday with my annual Spring swim with the Coney Island Polar Bear Club. How many years in a row do you have to do something before you can officially call it a tradition? :) Anyways, I've been absolutely aching for a water day, was torn between a swim and a paddle, but with a high of 75 on Sunday, I'm thinking a swim may better than a paddle - warm spring days here in the Northeast are actually not the best paddling days because the water is still very cold and you have to dress for that, not the air. The New York State off-season lifejacket rule -- the one that says anyone who's out in any recreational vessel of 20 feet or less must be wearing a lifejacket between November 1 and May 1 -- is still in effect. Also, we are having some wonderful weather here, but the water's still quite cold. Immersion gear (wetsuit or drysuit) is still a very good idea if you are going boating, but at the very, very least, please wear your lifejacket. This is always a bad time of year for boating accidents, a capsize that would be an amusing minor mishap in August can go south extremely fast here in April, and even on into May. For more information, please visit any of the links in the cold-water safety link list to the right. Thanks for reading, let's all be safe out there! Still crazy at work but had to share this new Poetry in Motion subway card featuring art by Sebago sailing co-chair Holly Sears. In addition to patiently teaching many, many newbies (including yours truly) how to sail dinghies, she is an AMAZING artist. This piece is from Hudson River Explorers, her glorious public art installation in the overpasses at the Metro-North Tarrytown station. 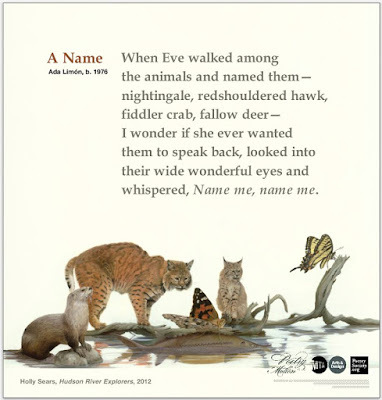 I always like the Poetry in Motion series and I'll be looking for this one especially! Click here for the two posts that I did after going to see the installation and the gallery exhibit that she had at the Hudson River Museum at the time that the piece was first unveiled. Also have to have a little "whoop whoop" moment today as Facebook kindly reminded me that one year ago today, I rang the bell after my last chemo infusion. I wasn't going to go to my Irish music session tonight but I think that's an anniversary that deserves a pint and a few tunes. Seeing the doctors is getting to be a less regular thing now, they extend the intervals between appointments as you go along without any trouble, but I had doctor week a couple of weeks ago and so far all's well.